Birthdays in my house are never a big grand party, but there's always an amazing cake. The kids get to pick what they want and I do my best to make it how they have invisioned it. Over the years I have made a giant hamburger, bear, frog, campsite, strawberry shortcake house, Tron, Star Wars, Hulk, ninja turtle, butterfly, motocross track, zoo, piano, airplane, and a Frozen cake. I know I left out some. I always have fun making ( and sneaking bites) of the cakes. Today my eldest son turns 10!!! Wow! I can not believe I have a kid that is 10! 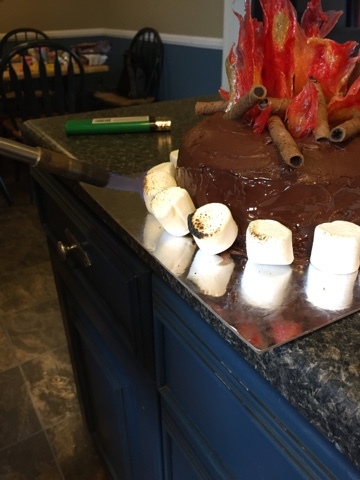 He has settled on a campfire cake this year. I made two round lemon cakes and then covered them with chocolate frosting. Chocolate buttercream is my favorite and I make it with a tiny bit of lemon juice to keep it from being to sweet. I used those chocolate Pirouettes from Preppridge Farm for the logs. The rocks on the outside are marshmallows. I used a blow torch to roast them. Be careful not to melt the frosting! 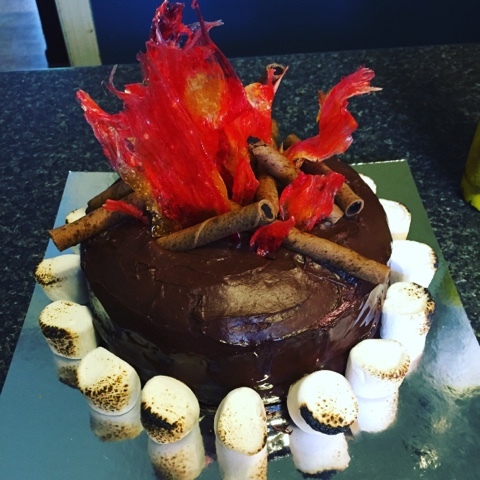 The flames can be made from fondant or fruit roll ups, but I decided to go with hard candy. 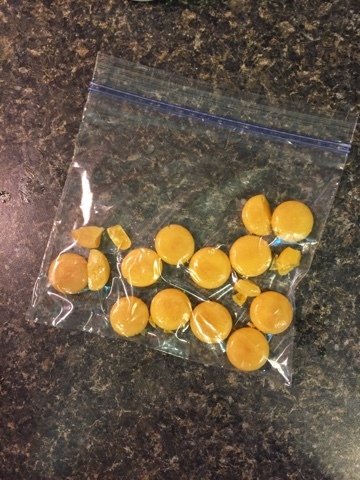 I already had a bag of butterscotch candies. Unwrapping several and placing them in a bag I used a rolling pin to break them up. 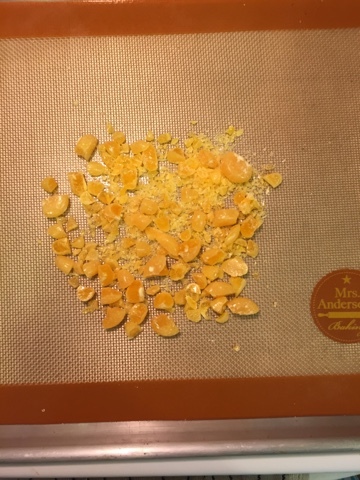 After they were broken I placed them on a silicone mat on a baking sheet. 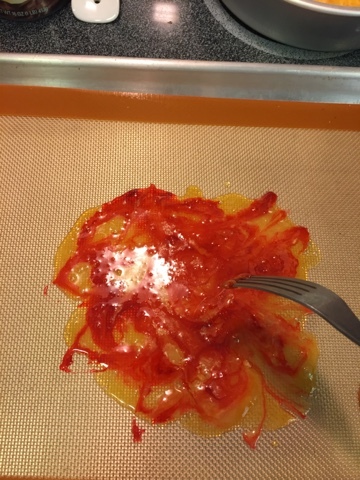 I added a couple of drops of red food coloring so that I could mix the colors after the candy melted. 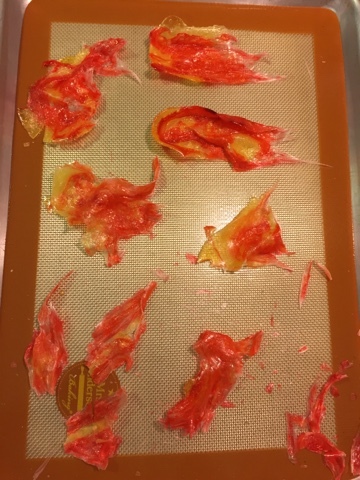 I preheated my oven to 325° and let them melt for 8-10 minutes. Don't let them begin to boil. 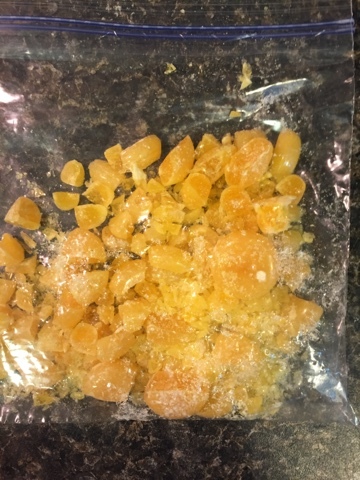 A few small bubbles is okay but pull them out right after. 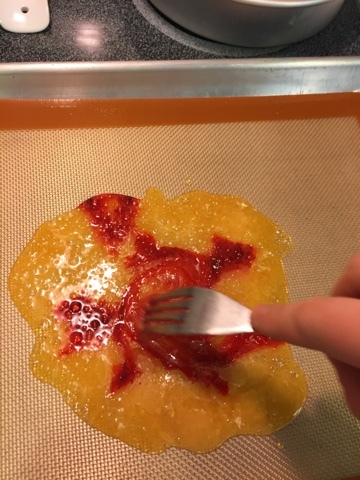 I used a fork to swirl the red into the yellow. 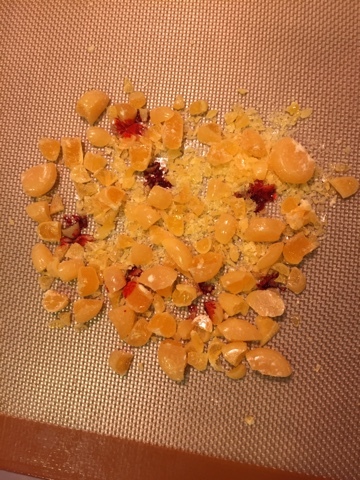 You could have easily just mixed a red candy in with the yellow during the breaking stage. I didn't have any red and I also wanted the candy to all be the same flavor. 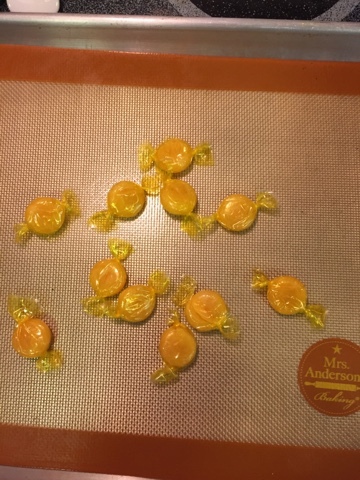 This candy is HOT! Please do not touch it right away. You can let it dry completely and then break it into pieces, but I wanted the pulled look. I let it cool for a few minutes and then very carefully began to pull pieces off and let them cool. Once cooled you can place them on your cake. Doesn't it look amazing?!? I can not wait to dig into it and my son was so happy with how it turned out. Yay for birthday cake!! !